Redco kiln wheel bushings are a cost-effective solution that have been proven over decades of use. However, the turnaround time on orders often reaches 3-4 weeks, which doesn’t work for emergency needs. Besides stocking up on extra bushings, there is the possibility of stocking plastic rod, which is available in both Redco blue (heat-stabilized) nylon as well as the Hi-Temp Yellow premium grade. While kiln wheel bushings are often provided with grease grooves, this is not necessary for emergency replacements. So as long as your mill has a simple machine shop, stocking rod could be a solution. Alternatively, you can reduce the complexity of the bushings to make them less expensive. This also means eliminating the grease groove in most cases, as that machining time needs to be accounted for. As with most parts, buying in bulk will save money, not only on the per-piece price but will further reduce costs by limiting the amount of shipping you will need to pay. 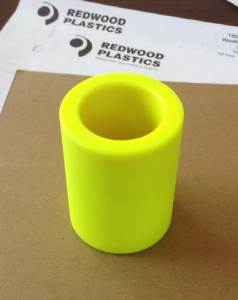 For a consultation with a plastics expert to discuss your kiln bushing requirements, please contact Redwood Plastics and Rubber.